The Holidays are quickly approaching! Is your hotel ready for Thanksgiving, Kwanzaa, Christmas, and/or Hanukkah? There are many ways that you can prepare for these holidays. Below we have developed a list of methods to get your hotel ready for the holidays and ensure that your business has a happy, seasonal environment. Wow your guests with stunning holiday colors in the dining room by offering holiday-colored overlays. These may include napkins, towels, tablecloths and other products that your business uses. Adding a traditional colored washcloth to your bathroom collection and/or choosing a bed scarf to ring in the holiday spirit would surely cheer up your guests that are having to travel throughout the holiday season. Creating your own custom holiday design that can be embroidered on terry cloth towels, pillow shams or robes. This will create a long lasting unique holiday decoration that will surely enhance your word of mouth advertising. These are just some of the few hotel preparations that your business can do to ensure that your guests have a happy holiday season. 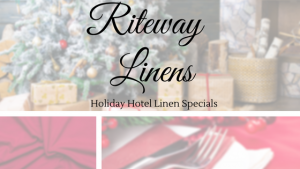 An added bonus in renting seasonal linen products is that all items created or purchased for the holiday season can be tucked away after the holidays and last for years to come! We provide high quality linen services and wholesale textiles to all hotels in need of luxurious and quality products which feature streamlined designs and rich patterns. Along with this, we also offer custom designs, perfect for the holidays. Your bath towels, shower curtains, sheets, pillowcases, and kitchen products can have the Wow-Factor this holiday season thanks to us. Give us a call at 772-336-0175 today and get in touch with one of our representatives ASAP. We will be more than happy in guiding you through the basics of our service, any specific questions you may have about the service, and how our service will benefit your business. We will assist you in every step of the way and even offer you additional advice in how you can prepare your business for this upcoming holiday season!